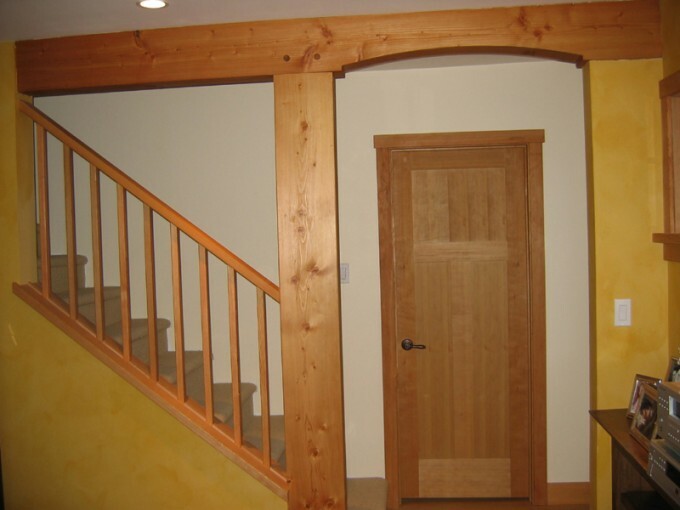 These timber framed accents make use of an elegant curve cut in the beam to artistically frame the entrance to the stairway. Some timber accents are used only for decoration, but these timbers are structural. A wall was removed where the railing is now, so the beam is supporting the load of the floor joists for the second storey. The timbers are made from douglas fir, and the door, door trim, and railing are vertical clear grain fir, all from local sources. The colour of the wood is complemented by the yellow clay paint that the owners used on the walls, which was an eco-friendly paint bought in ready to use cans.